All trip dates are US departure to US arrival. For example, the January 10-24 trip departs from the US on January 10th and arrives in Chile Sunday morning, the 11th. Departure from Chile is the evening of January 23rd so that you will arrive back in the US on January 24th. Your kayaking or multi-sport adventure trip is all-inclusive. Accommodations are at our comfortable lodge. Built two years ago in a secluded neighborhood, the lodge features plenty of personal and community space. A large living area with vaulted ceilings, a volcanic rock fireplace, and large glass doors that open to the deck and patio area provide functional areas for dining, dry land lessons, and group gatherings. Homey rooms and large bathrooms round out the amenities you will need for a comfortable stay. A computer as well as wireless internet is available in the lodge. Three hearty and nutritious meals are provided daily at the lodge. From our gourmet kitchen and slate-rock grill you will enjoy European and American dishes with a splash of local tastes. Fresh summer fruits and vegetables are a wonderful treat for visitors from the northern hemisphere. If you choose to dine out, we can recommend a number of excellent local restaurants as well. At Cascade Kayak School, we focus on instructional sessions to improve your kayaking skills while offering exposure to a variety of whitewater. The calm waters of Lake Villarrica can be used for rolling or flatwater technique workouts. 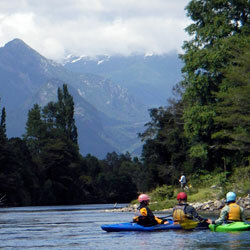 We spend much of our time on sections of the Rios Trancura and Liucura just outside of Pucón. The crystal-clear water of the Liucura provides technical class II and III rapids until it merges with the bigger volume class III Lower Trancura. The Upper Trancura contains more difficult class IV and V rapids. We use several locations along these rivers for stationary techniqe sessions as well. To gain some additional variety in river volumes and character, we take several day trips to other rivers. The fuchsia-lined banks of the Rio Fuy complement the clear blue waters of its stream. The upper section contains continuous class IV rapids that will challenge more advanced paddlers while the lower section offers well-defined class II and III whitewater. Bigger volume water can be found on the 21-kilometer stretch of the San Pedro. A drive of approximately two hours from Pucón will take us to higher volume class III and IV rapids with long wave trains and technical eddy lines. The Michin offers relaxing paddling and floating through some of the area’s most beautiful scenery. Depending on water levels, we often round out our river selection with the creekish Aluminé just over the Argentinean border. Technical boulder gardens with continual gradient keep the challenges and the fun rolling. Our instructional staff will select the best options for continuing your learning progression and adding to your Chilean Experience. Many airlines fly from the US to Chile. Depending on your location, there are several options for routes and carriers. Here are some of the more popular: LanChile from Los Angeles or New York United or LanChile from Miami or Chicago Delta from Atlanta American from Dallas Upon your arrival in Santiago, you will need to pay your reciprocal entry fee ($131 US), pass through immigration and customs before boarding a short domestic flight South to Temuco (about 1 hour and 15 minutes). We will meet you with ground transportation for the final leg of the journey to our base in Pucón. The drive of about 100 km will take us towards the Andes and along the green shores of Lago Villarrica. Travel to Chile requires a valid passport with at least 90 days between your travel and the expiration date of your passport. It is not necessary to secure a visa in advance; you will be handed a Tourist Visa on the plane that you must complete before passing through immigration. Your Tourist Visa is good for 90 days, but you will need to present a copy upon your exit from the country, so keep it in a safe place. 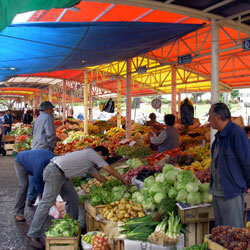 Chile is relatively free from poisonous creatures and plants as well as infectious diseases. No immunizations are required. For flight arrangements we suggest contacting Cathy King at Holiday Travel. She has worked with us for many years and is a valuable resource. She can be reached toll free at 1-888-850-9254 or by email at HYPERLINK "mailto:adventuretrips@hotmail.com" adventuretrips@hotmail.com. Weather is usually nice with temperatures of 80-90 degrees. Mornings and evenings can be cool, and there is a possibility of rain, especially in January. Pucón has all the amenities of a small resort town. There is a large grocery store where most items can be found, should you need anything you might have forgotten. Linens and towels are provided with your room. Should you need any clothing washed during your stay, we offer a laundry service in the middle of the trip. As a reminder, most airlines limit luggage to two pieces of 50 pounds or less per passenger. 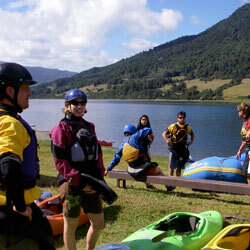 In addition to the items listed above, you will need your kayaking equipment. Many of the rivers we will paddle have fairly cold water and a second set of gear (particularly insulation) is nice so that you don’t have to put on wet gear when you head out in the afternoon. We have a variety of boats for your use including WaveSport, Pyrana, Jackson, Perception and Dagger models. If you have specific questions regarding boats, please feel free to give us a call for more information. Located on the north side of the Villarrica Volcano and on the shores Lake Villarrica, Pucón is a popular destination for tourists of all nationalities. In the language of the native people, the Mapuche, Pucón means “the gateway to the mountains.” Indeed, this typical Chilean village of approximately 9,000 residents is surrounded by natural wonder; volcanoes, lakes, mountains, rivers, hot springs, caves, and more. With rafting companies, grocery stores, Internet cafes, coffee shops, ice cream parlors, and more along the main street, Pucón has the relaxed atmosphere of a summer retreat. The lively downtown area features open-air markets, a variety of restaurants, and boutiques—a unique combination of the fun and functional. Upscale hotels and casinos line the beach of Lago Villarrica, which offers swimming, sunning, boat rentals, and ample opportunities for rolling and technique tune-ups. The surrounding area boasts many sightseeing and recreational diversions. The most notable of these is the chance to climb the active volcano that towers above the town of Pucón. 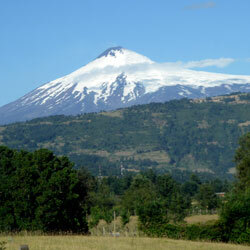 The day-long excursion will take you to the summit of Volcán Villarrica. If wind conditions permit, you can peer into the cone to view the escaping gases and sometimes, molten lava. Trips are offered daily through Sol y Nieve. Also in close proximity to Pucón are los Ojos de Caburga park and waterfalls, hot springs, a zip-line (canopy) tour, horseback riding and more. To the West of our area is the coastal port of Valdivia. Highlights of the city include a tour of the Old Spanish fort, the artisan center on the wharf, and the harbor sea lions. Relive a piece of Chile’s history as you wander among the cannons and back through time.